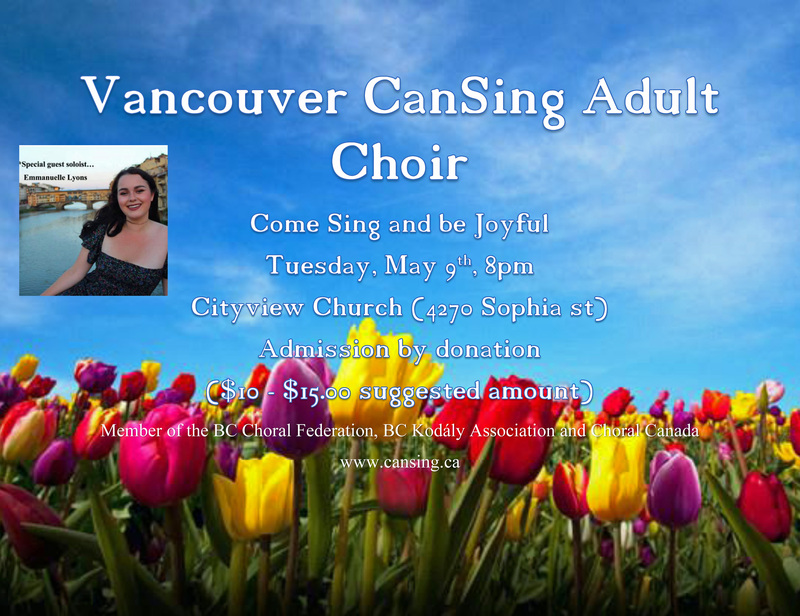 Vancouver CanSing Adult Choir presents COME SING AND BE JOYFUL, Tuesday, May 9th, 8 – 9pm, Cityview Church (4370 Sophia St – 5 Mins East from Main & 28th). Admission is by donation (suggested $15 – $20.00 to cover rent and professional fees). The choir will perform seasonal songs by Antonio Vivaldi, Srul Irving Glick, Larry Nickel, Billy Joel, Harold Arlen and more. Special guest and returning VCS Choir soloist will be Emmanuelle Lyons, third year UBC opera Singer. This entry was posted on Thursday, April 20th, 2017 at 1:40 pm	and is filed under Welcome to CanSing. You can follow any responses to this entry through the RSS 2.0 feed. Responses are currently closed, but you can trackback from your own site. « VCS Level 1 & 2 choirs present LEMONADE and Songs. Friday, Mar 3, 7 – 7:45pm & Tuesday, Mar 7, 5 – 5:45pm Cityview Church (4370 Sophia St.).